Allardyce watched his side win from the safety of the stands at Ewood Park. (CNN) -- Blackburn manager Sam Allardyce kept away from his players during their 5-2 English League Cup win over Peterborough as the Premier League club battles swine flu. 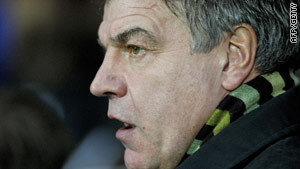 Allardyce spent the whole of Tuesday night's match at Ewood Park in the stands because he was feeling unwell. Assistant manager Neil McDonald confirmed that Allardyce took the measure as a precaution after having three of his first team squad and a number of staff hit by swine flu. "He is feeling a little unwell, so he sat upstairs as he wanted to see the picture from above," McDonald told Sky Sports. "He trusts in his staff which is excellent, and he was at the game but he didn't want to take any chances. "He shot out just to make sure nobody gets what he might have," he added. McDonald said the swine flu outbreak was under control and no new cases had been reported. Fellow north-west side Bolton have also been hit by an outbreak which comes as the English Health Protection Agency has warned players that spitting on the pitch could increase the risk of passing on infection during matches. Blackburn were thumped 5-0 by Chelsea in the English Premier League at the weekend, but reached the quarterfinals of the cup competition with a polished display against second-flight opposition. Allardyce was angered Blackburn were forced to play Chelsea or risk punishment. "If there was a swine flu outbreak, you couldn't call a game off, no matter what," he claimed. It is in contrast to the approach being taken in other countries, with last weekend's French league match between Marseille and Paris Saint-Germain postponed after three players from PSG contracted swine flu. A Blackburn club spokesman later confirmed that Allardyce would return to work on Thursday.